Properties in Catalonia average 4.4 out of 5 stars. Property 2: Villa with private pool, tennis court, petanque place and beautiful garden. Villa with private pool, WIFI and Air conditioning. Property 6: Villa with private pool, WIFI and Air conditioning. Property 10: Villa Riells Mar for 8 with a private pool only 350m from beach and commerces. Property 18: Catalunya Casas: Modern Villa Mestral for 9 guests, only a few km's to the beach! 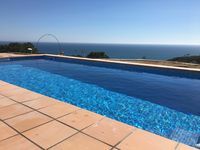 Property 21: Club Villamar - Wonderful villa in Lloret de Mar with private swimming pool and beautiful view. Property 27: Pretty villa with private pool, close to the sea. Property 34: Beautiful Catalan villa face sea. Ds feet sand 1h BCN. Property 36: 12 metre private pool plus sea, mountain & castle views. Beautiful modern villa! Property 37: Spacious villa with beautiful views, garden and private pool-all inclusive. Property 40: Magnificent villa with private pool. Excellent home, highly recommend!! Jacques and Anna are great hosts. We loved our stay at The Beachouse. We were actually pissed we had only booked 1 week because it was the PERFECT place to unwind with our 4 month old baby. You're a little bit off the beaten path and it's great to feel part of the daily local in Ametlla Del Mar (were you can namely buy freshly caught tuna). The living spaces are great for spending a relaxing day by the pool and cook a great diner at night. There's also a great little beach about 5 minutes away (Cala Xelin). We would consider coming back at The Beachouse for sure. Thank you Mireia!